I am a preservice teacher currently doing observation in a high school English classroom. In my classroom, I have been awed by the ways that students really step up to the plate and take responsibility for their seminars when the teacher steps back. While some students still remain silent during our seminars, more and more are participating in meaningful ways during each new seminar. They build off each other’s ideas, stay attentive, challenge each other, and use evidence and reasoning. I really love observing these seminars and am often disappointed when they are done, wishing I had done something to record them. While students do evaluate their own participation in the seminars, they don’t really have a space to reflect at length. I think your practice of having students reflect on what they’ve learned is a strategic way to record and extend the benefit of the seminars. It was inspiring to read the examples of student excitement and growth in your post. I would love to have students do reflections on seminars in my student teaching or my own future classroom. Thanks, Kris. Definitely do seminars in your classroom. Some of the richest learning will take place when you give students the floor. You are right: having reflection after Socratic Seminars seems like a really important step for the learning. Not only are students taking charge of the discussion, but they are also taking charge of their processing and evaluating of it. 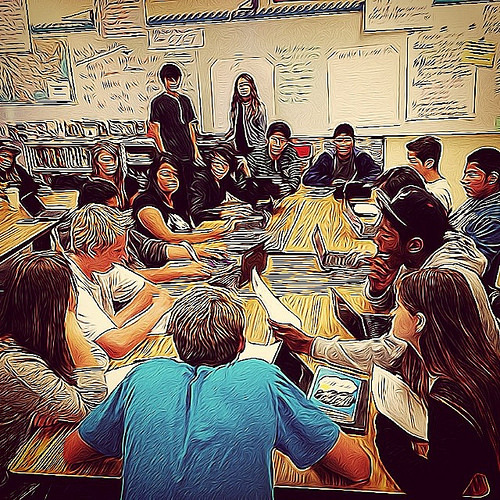 My students did Socratic Seminars at the beginning of this year (without much structure and a little bit of reflection), and I’m really hoping to do it again. The fact that you give examples here from discussions of _King Lear_ and _A Thousand Acres_, which my students also recently read, inspires me even more to try to make it happen sometime soon. I really like the idea of having students design the framing Essential Questions — and I hadn’t thought of the effect of not looking at students when they’re talking (but you probably have a good point there). Thank you for sharing your and your students’ reflection and ideas here! Thanks, Claire. I learned a lot about doing seminars well from my colleague, Cindy Sabik. I’m also a preservice teacher just like those above. I’m very interested in running a Socratic Seminar next semester when I’m lead teaching my mentor teacher’s 11th grade class. We’ll be studying Lord of the Flies, which is a challenging text in many different ways. I love the reflective component that you’ve discussed here; I think reflection is one of the most helpful ways of getting students more engaged with the work, as well as getting them to participate in class discussions. I would love to know more about your process of selecting questions to ask students in their seminar reflections. I imagine it took quite a bit of work to come up with just the right questions that got students making connections and thinking about the discussion holistically. Thanks, Allyson. First, you can go with the essential questions for the unit if you use UbD (yet another reason to use backwards design!). However, I have found great success with asking the students to come up with the questions they want to discuss. I usually only let them do one or two. I just had a seminar with my 9th graders that was a bit rough. I collect their reflections tomorrow, so I’ll be interested to see what they think. I chose the questions for them in that case. However, 11th graders should be able to come up with questions on their own. Thinking about big themes, big questions: things that would be great essay questions are great Socratic seminar questions. Thanks Dana for inspiration here. Just came across your blog and smiling big. We’ve got a Socratic Seminar coming up next week with our students as they uncover the many layers of transcendentalism from a few American favorites. Your ideas for deeper reflection and examples triggered new ideas for us as we plan. The bonus was to see that you’ve found Equity Maps helping to make the seminars even more powerful. Can’t wait to hear more. V2 will be out soon and will provide many more ways to help students and educators to reflect. You’ll be able to track the nature of each student’s contributions and show the students as well. New ways to set up the class as well. Awesome to hear and read about your work! Thanks, Dave! I am excited about version 2. I would love to be able to track the nature of the contributions. I am currently using a shorthand system in the Notes to do that. Also, I have long rectangular desks, and I find it hard to squish all the kids along one side of the table with the square. When I was in high school, the days that we would dedicate to Socratic seminars in English classes were my absolute favorite. I loved having the chance to bounce ideas off my classmates to see if we could find answers to some of the bigger themes in the books that we read- usually we couldn’t ever find clear meaning but I think it’d be alarming if we could have all come to the same conclusions without variation. Now that I’m on my way to becoming an English teacher it’s interesting to read about student reflections. I’ve always known that I wanted to incorporate Socratic seminars into my class and I feel like the idea of having students set goals for the next seminar is an absolutely great idea! Thanks, Ronnie. It’s nice to imagine my own students will reflect so fondly on seminars. The reflection piece has been a game-changer for me. I can’t take credit for creating it, but I have benefited so much from using it. Bad Behavior has blocked 986 access attempts in the last 7 days.